Urban farming is on the tip of everyone’s tongues these days. But what about peri-urban farming, or growing food at the urban edge? For Sibella Kraus, director of the nonprofit organization Sustainable Agriculture Education (SAGE) and founder of the Ferry Plaza Farmers Market, this approach is a promising piece of the food system puzzle. Not only do nearby farms provide fresh produce for city residents, but they allow interested farmers to grow food without having to commit to living in rural areas. “Some folks are ready to move to places like Watsonville or the Capay Valley and really build up a good sized farm,” says Kraus. “In other cases, you may have a couple and one person wants to farm and the other person wants to have a job in the city…I think there are lots of different kinds of circumstances where this edge really makes sense.” And while farmers with small plots just outside cities can make a living off five or ten acres, getting a hold of the land is another story. “Small plots are really straws in the wind when it comes to the politics and economics of urban edge land use,” she adds. A few years back, Kraus and her colleagues at SAGE devised a possible solution in the form of an agricultural park, a piece of land that could not only be leased to a number of small-scale farmers, but could also serve as an educational space and a model of natural resource stewardship. In 2006 — after a few years of research and planning and an in-depth feasibility study — SAGE began a collaboration with the San Francisco Public Utilities Commission, which owns several pieces of land outside the city for the purpose of transporting water from the Hetch Hetchy Valley. 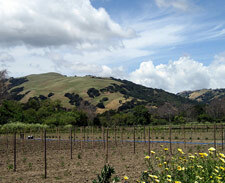 The result is the 18-acre Sunol Agriculture Park, which currently houses four small organic farms: Iu-Mien Village Farms, Terra Bella Family Farm, Baia Nicchia Farm and Nursery, and Fico, a specialty fig operation. (People’s Grocery was also farming several acres until recently). Each farm leases the land, while SAGE has provided useful infrastructure, such as a farm manager, fences, roads and a flexible irrigation system that allows multiple farms to access water at once. On the land stewardship side of things, SAGE has also developed and maintains hedgerows and filter strips that help protect the watershed and ensure that all farms provide enhanced habitat for pollinators and beneficial insects. Iu-Mien Village Farm is a great example of the type of incubation the AgPark has made possible. 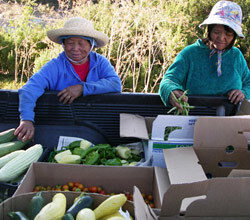 The farm is leased by the East Bay Asian Youth Center, which received a multi-year grant to support Mien families (an indigenous ethnic population from Laos) interested in farming. For the last three years, five families have been able to grow food for themselves and for barter, selling just enough to pay for gas. “These were families that wanted to farm in Oakland, but didn’t have land,” explains Lew Chien Saelee, who coordinates the program for EBAYC. She says that while a location closer to Oakland would have been ideal, “it was very good they got the land. For some of these families, all their experience before now was in farming.” The climate in Sunol is perfect for growing many of the same vegetables that grow in Laos, like long beans, squash and onions. On the other hand, says Saelee, farming in rural Laos is chemical free and rain is common year-round, so the need to follow certified organic standards and irrigate the fields did present a learning curve for these farmers during the first year of the project. One Mien family had grander goals to farm on a commercial scale. They were given the use of more land to produce organic strawberries (a crop that is generally more lucrative than vegetables) to s to both Berkeley’s Monterey Market and Whole Foods. Currently around a dozen schools visit the AgPark every year, but — now that the farms on the land have become somewhat established — SAGE has plans to build a permanent interpretive center that would provide learning opportunities for thousands of school kids on a regular basis. SAGE is also consulting on several other potential agricultural parks in the area, including one in San Jose.